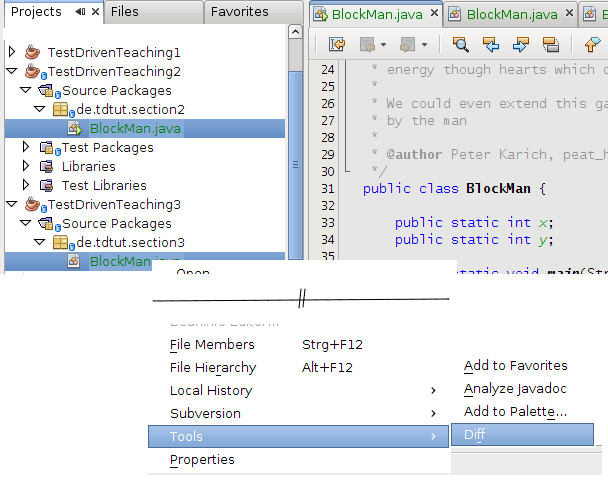 In the previous sections we learned how to create a simple Java program and tested it. We mainly did procedural programming, while now we will learn how to better encapsulate functionality and data with the help of object oriented programming (OOP). The aim of OOP is mainly to provide better code re-use than it would be the case with procedural programming. With OOP it is easier to write large software and personally I think, it leads to better readable code. An object is a self-contained entity which has its own collection of properties (ie. data) and methods (ie. operations) that encapsulate functionality into a reusable and dynamically loaded structure. After a class definition has been created as a prototype, it can be used as a template for creating new subclasses (via extends keyword) that add functionality. … Applications can request new objects of a particular class on demand via the new keyword. Open it in your favourite IDE and we will now apply some necessary refactorings (code changes) to transform a procedural program into a more object oriented one. What is refactoring? Code refactoring means code changes, which have the aim to make the code better readable or introduce a cleaner design. But refactoring does not change how the applications works. Now we need to refactor the test cases and after the test compiles, it should pass as well. This shows one advantage and one disadvantage of test-driven development: you have to refactor all tests after refactoring which costs some time, but at the same time you can run those tests and make sure that all works as before. The first man man1 is located after this operation at x=0 and y=1 (0; 1) but man2 is located at a different location (0; 2) after the move method call. This table was taken from sun, where you can get more information about this topic. This is not good in the most cases and as you see here: the y value is not in its correct domain [0; 10). External code could change the variables without knowing the bounds or sth. else. E.g. the move-method is a better approach to change the variables x and y. Now you can simply remove the setX method and ‘external code’ is not able to change x without the appropriate move method. More details on subversion was given in the second section.